Does a higher Colour Temperature (Kelvin) bulb produce more light? Yes, the higher the Kelvin, the greater the Lumens. However, after a certain point, higher Kelvin can damage your eyes. Why does my LED bulb flicker? LED bulbs flicker due to voltage changes taking place in the wiring. If you turn on a microwave and the refrigerator is running simultaneously, your LED may flicker because of the load that alters voltage levels. This could also happen due to a malfunction in the circuit. Is Syska LumiStar suitable for domestic use? Syska LumiStar is a high Lumens bulb, meaning it can generate higher Lumens/Watt as compared to a regular bulb. This way it draws less electricity and proves to be eco-friendly. Hence, it is ideal for domestic application. How is Syska LumiStar different from other bulbs? Syska LumiStar is a high Lumens bulb, meaning it can generate higher Lumens/Watt as compared to a regular bulb. While normal bulbs generate 100Lumens/Watt, LumiStar bulbs generate 120 Lumens/Watt, hence consuming lesser electricity. What is the lifespan of Syska Lumistar? Syska LumiStar provides up to 50,000 hours of Burn Time. This is around 8-10 times more than an ordinary CFL. How does the Syska Tri-tone bulb work? The Syska Tri-tone bulb is eco-friendly and works to conserve electricity, emitting only as much light as the room needs. The bulb offers three levels of brightness - 100%, 70% and 30%. Simply switch the bulb on & off to change between the brightness levels. What is the lifespan of Syska Tri-tone bulbs? Syska Tri-tone bulbs provide up to 50,000 hours of burn time. 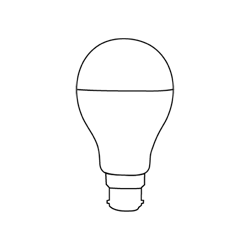 This is around 8-10 times more than an ordinary CFL.Burn Time defines how long (in minutes or hours) a source of light will produce a useful amount of light. What is the spacing requirement for installing LED Downlights? It is recommended to install LED Downlights 1 m away from the walls and to keep a 1.2m to 1.5m distance between the lights. This can be adapted and changed based on the design of the room. What is the working voltage range for bulbs? All Syska LED bulbs come with a wide working voltage range of AC 90V to 300V, 50Hz. How many lumens is a 9W bulb? A standard Syska LED 9W bulb (PAG and SRL series) is 900 lumens giving an output of 100 lumens per watt. In order to claim warranty or to register a complaint, kindly contact our toll free number to register a complaint. A customer service exective will be able to help you.